However with my latest project, I think I have a lovely balance of ridiculous and functional. Shorts! I'm wearing them now and they are so fabulously comfortable - and cute! 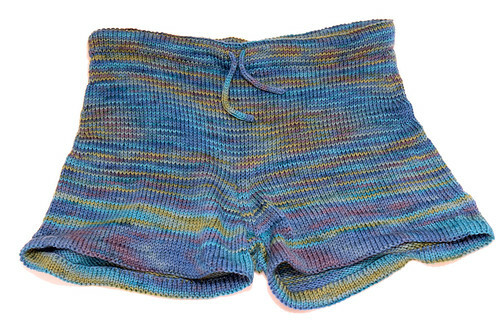 But you can't say that hand knit shorts aren't a little ridiculous. Which, honestly, point in their favor. 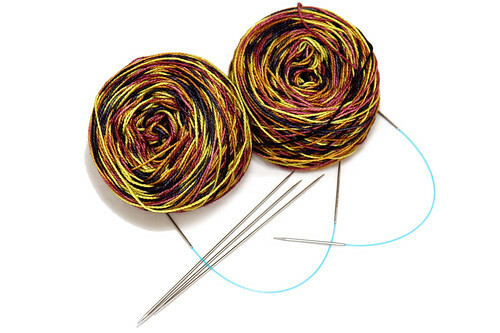 Before I do all that, though, I'm (unsurprisingly) going to knit another pair of socks. Well, hopefully. I'm not too far into them right now. You may notice that "not too far into them" actually equates to "haven't actually started them". But I've wound the yarn and picked the needles so actual knitting isn't too far away! Thank you! They are super comfy, too! You have me curious. Those do look comfortable. Did you use a pattern? I might make at least one pair for myself. They are completely fabulous and crazy comfortable! I did use a pattern (and is remarkably well-written and easy to follow) - Assets of Evo. My Ravelry project is here http://ravel.me/aug3zimm/aoe and it is linked to the pattern. Highly recommend it - it even has a crotch gusset! Seriously a great pattern. Thank you so much! I've logged onto Ravelry and have added it to my queue. We are friends there, OpalT. I can't work on it immediately. I wish I could; however, I promised my daughter that I would knit her a summer hat.She's requested a knitted beanie. She lives in this cute owl hat that I had made her about three or four years ago. I think I'll sew a few for her also. This is my newest site. It's almost exclusively about the crafts I love.